Microblading in is a semi-permanent tattooing technique that creates hair-like strokes to fill in sparse or thinning brows. Permanent makeup is a cosmetic technique which employs permanent pigmentation of one’s skin as a means of producing designs that resemble makeup such as eyebrows and eyeliner to enhance one’s overall beauty. It involves using a needle to place pigmented granules beneath the upper layers of the skin. Each service takes between 60 to 120 minutes depending on the complexity of the service. The artist will use a topical anesthetic to numb the area being tattooed to minimize any discomfort. WILL YOU SHAPE THE EYEBROWS FIRST? Yes, shaping is our specialty. We always shape and draw in the eyebrows first before starting a permanent makeup procedure. The client will always approve the shape and color of the eyebrows before pigment is placed onto the skin. WHAT SHOULD I EXPECT AFTER A PERMANENT MAKEUP PROCEDURE? You may experience minor redness on procedure day. Just like any tattoo, initially the color will appear brighter or darker but will get lighter and more natural looking with each passing day. The tattooed area will start to peel anywhere between 4-7 days and will look more as intended throughout the following weeks. You may resume normal activities immediately except that you will be advised to wear no makeup directly on the treated area for about one week. Most resume their regular schedule, such as returning to work, the very next day. It is advised that for very special occasions or anytime you want to look your super-best that you allow one week of healing time. WHAT IS THE BENEFIT OF GETTING A PERMANENT MAKEUP PROCEDURE? The most obvious benefit to permanent makeup is that it enhances one’s beauty giving way to much more natural looking eyebrows. You essentially get to wake up with your “face on.” You can swim, exercise, shower and fall asleep without having to worry about your makeup smearing or coming off. Additionally, having permanent makeup saves a ton of time in having to shape and draw in eyebrows and eyeliner every day. Time is something that is limited and cannot be valued enough so why not make the most of it. IS PERMANENT MAKEUP PROCEDURE PAINFUL? Most describe the permanent makeup procedure as a slight discomfort. We try to minimize that discomfort by using a top-of-the-line topical numbing solution. Some clients even describe the service as experiencing no discomfort whatsoever. Either way, Victoria Eyebrows carries varying degrees of numbing solutions and will apply the most appropriate one depending on one’s tolerance and skin type. This is a tricky question since so much depends on one’s skin type, body chemistry and lifestyle. We always schedule a follow up appointment 6-8 weeks after the initial service to add pigment only to those areas where the skin may have not taken pigment as intended. More often than not, however, a touch up is not required. In general, we recommend an annual maintenance (color refresh) for all clients. Absolutely not. 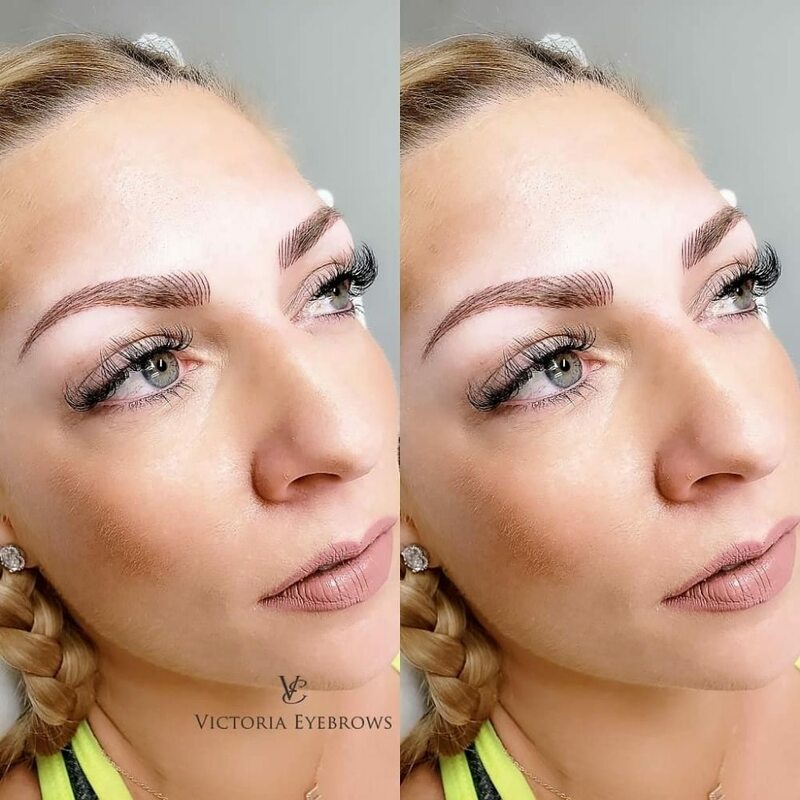 At Victoria Eyebrows, we use the highest quality pigments and therefore you will never have to worry about the color changing (to blue, red, green, etc.). Like all tattoos, the color will eventually fade over time and that is why we recommend an annual maintenance for all clients. IS PERMANENT MAKEUP SUGGESTED IF I AM PREGNANT, BREASTFEEDING, USING RETINOL OR TAKING ACCUTANE? We highly advise that if you meet any of the above conditions that you wait to get permanent makeup done in order to get the best results. Please note we will refuse a permanent makeup service if you meet any of the above conditions. Please contact Victoria if you are interested and she will be happy to answer any other questions you may have.